I've noted my love of architecture before and that I will feature architecture here on wanderlust ATLANTA because as a tourist, I frequently find myself fascinated with a city's architecture. 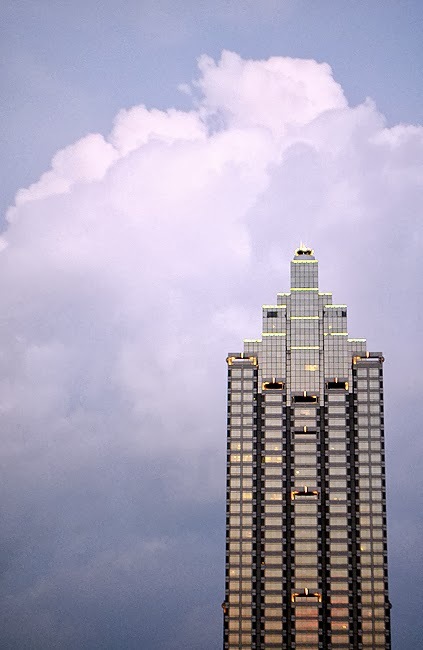 One of the skyscrapers in Atlanta's skyline that captures my imagination is SunTrust Plaza, the tallest skyscraper in downtown Atlanta. Atlanta's tallest building is the nearby Bank of America Plaza, but she's in Midtown, thus SunTrust Plaza's claim as the tallest in downtown Atlanta, at 871 feet tall (902 feet tall with antenna spire), with 60 stories. My love of architecture combined with my love of the camera has given me some unique views of buildings around the world. This particular shot was made from the balcony of a friend's penthouse home in nearby Museum Tower.Being that high up, makes for some beautiful photo ops, which I sometimes am so engrossed in the beauty before me, that I forget to break out the camera—not necessarily a bad thing. Follow the links within to learn more about SunTrust Plaza and when you visit Downtown Atlanta, be sure to enjoy all the artwork surrounding SunTrust Plaza, much of it designed by renowned architect, and architect of SunTrust Plaza, John Portman.